The Hawaii Real Estate Salesperson Exam is divided into two separate tests. The first segment is the real estate salesperson national exam. 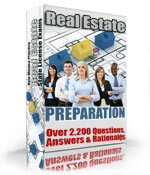 The second segment is the real estate salesperson state specific exam. The national part of the Hawaii Real Estate salesperson exam is comprised of 80 questions. In order to pass this part of the exam, an examinee must answer 56 out of the 80 questions correctly (70% correct). The state portion of the Hawaii Real Estate Salesperson Exam consists of 50 questions. An examinee must answer 35 of these questions correctly to pass (70% correct). The time allowed for the Hawaii Real Estate Salesperson Exam is 4 hours. You must finish within this time frame. In Hawaii, if you pass one part of the Real Estate Salesperson Exam, you are permitted to take the subsequent part at a later date, as long as both are passed within 2 years. The Hawaii Real Estate Salesperson exams are computer based. You will sit in front of a screen and use a keyboard to take the test. The exam is closed book, you will not be allowed to have any study aid with you. You are permitted to bring a simple functioning calculator as 10% of the exam questions may involve solving math problems. Be sure to bring two forms of Identification to the testing site. Arrive at least 30 minutes early. Do not show up more than 15 minutes late or you will not be allowed to take the test. The registration fee to take the Hawaii Real Estate salesperson exam is $68.